How often have you coveted a trendy pair of boots you’ve seen on the runway, impulsively bought it only to find you are not sure how to use it? 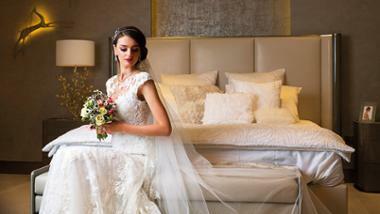 The item then sits in the back of the closet, hardly ever seeing the light of the day, or the night, for that matter. But don’t sweat. We have gleaned tips from style gurus on how you can use this comfy footwear in versatile ways as well as what to keep in mind when picking a new fashion statement pair. The slouchy boot continues to be a hot trend this season too and the huge appeal of this ’80s trend lies in its easygoing, uber-effortless vibe. The slouchy versions look especially cool in the long-boot styles such as thigh-high or knee-length versions. Leather being a harder material, the effect of slouch in leather boots appears far more pronounced and therefore more impactful than similar boots in suede. Because of the slouch, this boot looks less dressy than structured leather boots and has a touch of effortless style to it. 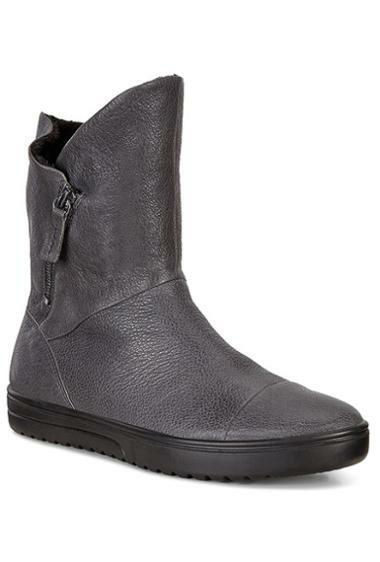 Slouch leather is also the perfect solution for those sceptical about going down the traditional long leather boot route. 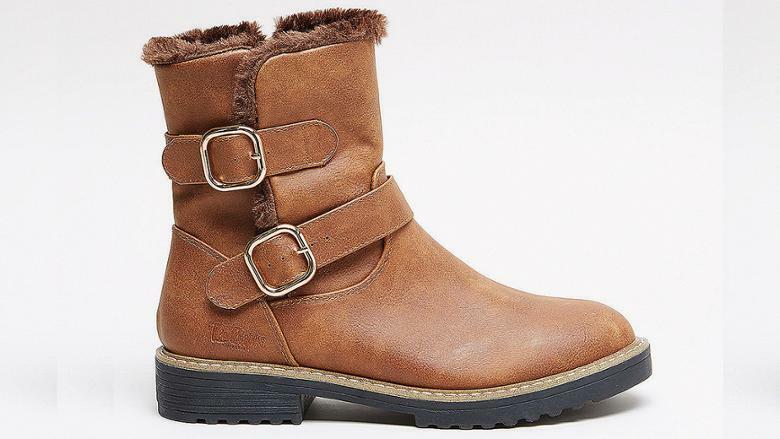 Shorter slouchy boots are available in different materials, so you are spoilt for choice. Calf-length, flat-heeled slouchy boots are, of course, the most comfortable and score high on versatility. These can be styled with just about any casual attire – a pair of skinny jeans or shorts, skirts, dresses or even leggings. For the adventurous, there’s the crystal-embellished one with stiletto heels that can be paired with a little black dress for a dramatic party statement. Owing to their colour, white-heeled booties are unique in their urban vibe and that’s why they are a tad tricky to style. Ankur Srivastava, head of fashion design, Max Fashion, advises going for the original western vibe with these white boots. ‘Go for a flared-cut denim and a button-through printed shirt for a western vibe. Or simply pair the white boots with a free-flowing maxi dress for a bohemian aesthetic,’ he says. Shoemart’s design team spokesperson suggests another way to style white booties: skip sneakers and team your track pants or cropped jeans with white ankle boots. You could end up becoming a style influencer this Fall. These sophisticated mid-calf length slender boots with stiletto heels have a tight top shaft that’s made of thick sock fabric. 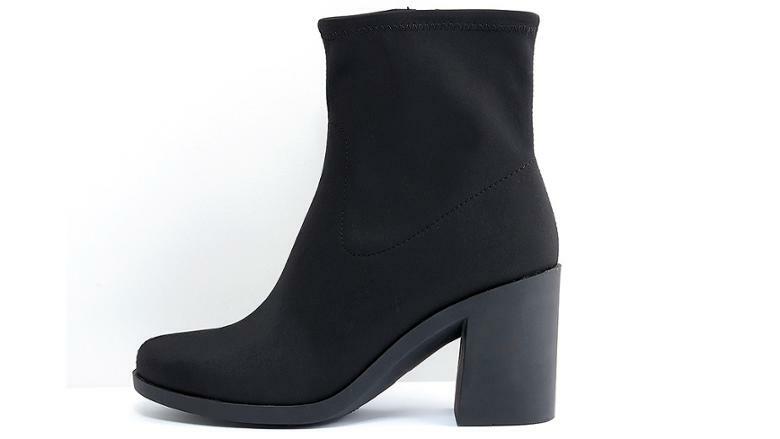 The sock fit boots look super-sleek and ladylike and have a snug fit. For a polished vibe, pair these with fitted or flowy formal dresses no longer than knee length. Black sock boots are a must-have in your wardrobe, but don’t stop with just that one shade. 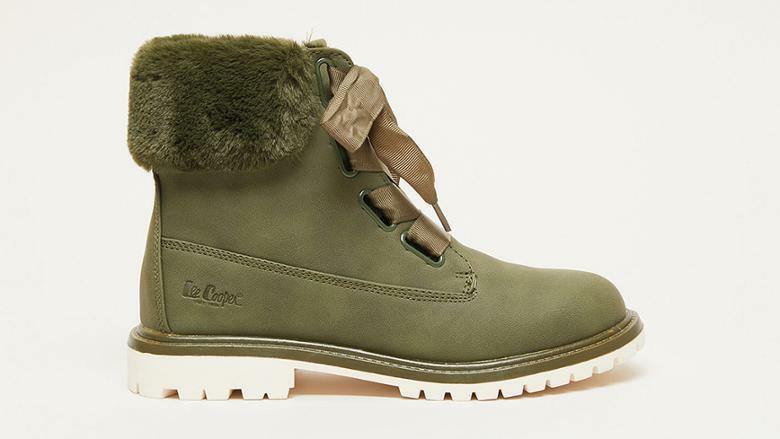 Explore boots in other colours and materials. A new variant of the sock boots has sporty stripes on the rim of the socks portion. Pair it with a luxurious tracksuit; the striped sock boot stiletto could be used to give athleisure outfits their most glam finishing touch. 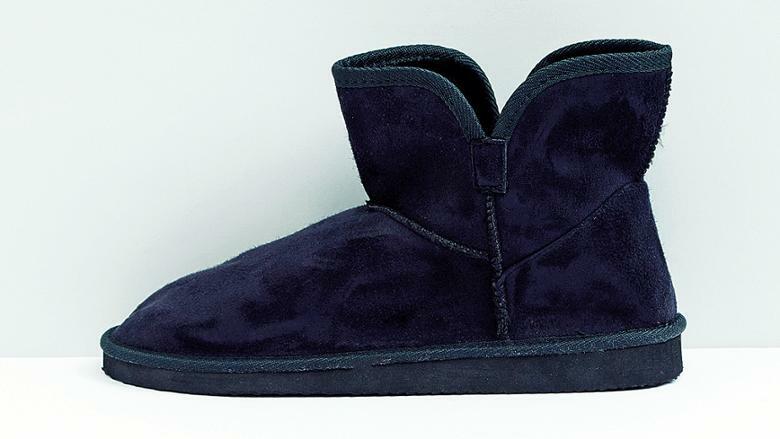 Ugg booties have made a return to fashion – check out the range of fur-lined styles lining shelves this season. Try not to sport them with tights as you might end up looking a tad too ‘wintery’ for the UAE. The flat-heeled Ugg-inspired boots come across as cute and youthful, and can be incorporated in our winter wardrobe too. ‘Wearing a slip dress with a cosy cardigan and fur-lined boots is apt for the gentle Dubai winter,’ advises the design team spokesperson at Shoemart, whose latest collection features several Ugg-inspired fur-lined boots. There’s one ‘don’t’ for petite girls here. Just like ballet pumps or flat sandals do nothing to raise the style game for petite girls as their legs appear shorter, similarly, booties that are flat-heeled are a no no. Go for stilettos. Second, not all women can carry off over-the-knee boots well. Petite women will find that even the slightly over-the-knee boots extend to their upper thighs and therefore an actual thigh-high version might end up looking odd on them. 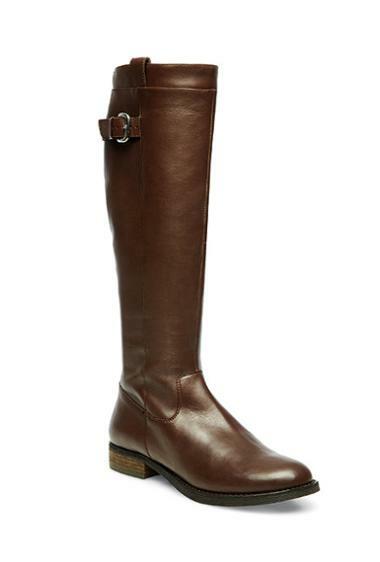 So, first assess the right height of the long boot that you require before picking a long thigh-high boot. Visual weight: Boots by their very nature, are a visually weighty shoe style – a reason they tend to become the focal point of a look. The higher a boot is, the more visual weight it carries and makes you look dressier. Personality: Boots come across as a bold accessory and project an equally strong and bold personality of the wearer too. Long boot styles appear bolder than shorter ones. When choosing a new kind of boot, ask yourself if that’s the personality you wish to project for yourself and how bold an effect you want to create. 5 points: When choosing a pair of boots to style your dress, keep in mind: The length of the boot, the heel, the material, the colour, and purpose of the boot. The clever styling solution to wearing boots during Dubai’s winter lies in channeling the right season vibe. When wearing boots in Dubai’s mild winters, remember the aim is not to create an extremely ‘wintery’ vibe (as that would be a faux pas!). Instead, follow the style trend for a mild winter or ‘autumnal’ vibe of cold countries. You can wear any length and fabric of boots as long as you don’t style them with tights, especially not the opaque kinds as those are for snowy climes. If you must, get a lightweight, transparent pair and ensure you wear it only for an evening out, when you are expecting to be spending a lot of time outdoors. ✱ Leather boots are a bold look but women universally love the rockstar vibe that a leather boot can bring. These boots come with their own styling challenge as they tend to look quite dressy. Black leather boots are dressier than brown ones, so pair them with your evening wear. With brown leather, you can easily carry off a chic daytime look. Create a uniquely contrasting appeal by pairing black skinny jeans with classic brown leather booties and a leather bag with just a bit of the ankle showing. Ditto for white jeans with brown leather booties and a brown leather bag. As a rule of thumb, go for the slouchy leather material for knee-length boots. 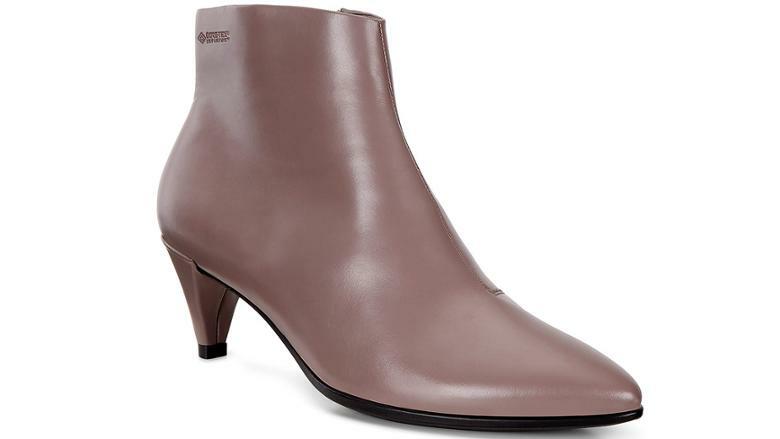 Structured leather material is best limited to shorter booties. Also, leather being a hard material, it may not be very comfy for tight over-the-knee styles. ✱ Suede is every fashionista’s fav boot material. Suede’s napped rough finish makes it particularly appealing while its softer and more pliable texture adds to the shoe’s comfort quotient. Little wonder suede thigh-high boots are extremely comfy. 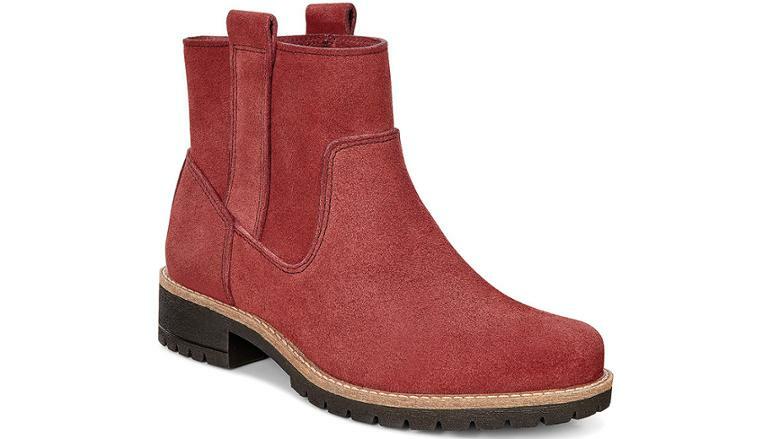 The material adds a touch of lightness and effortlessness making it versatile and suitable for as an all-year-round boot. Suede thigh-high boots are softer above the knee and ideal for the mild Dubai winter. They don’t look as dressy as long leather boots. While thigh-high leather boots may look uber-glam on runway models, they are dressier and less comfy compared to their suede sisters. 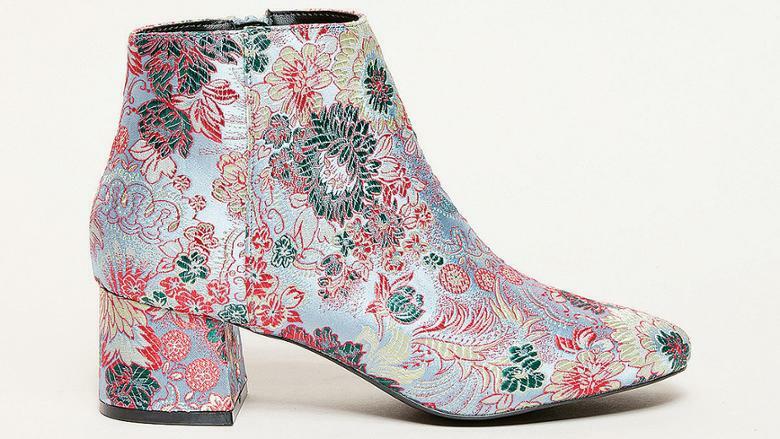 Booties made of brocade fabric. The allure of heritage woven materials like brocade expands into boots this season. 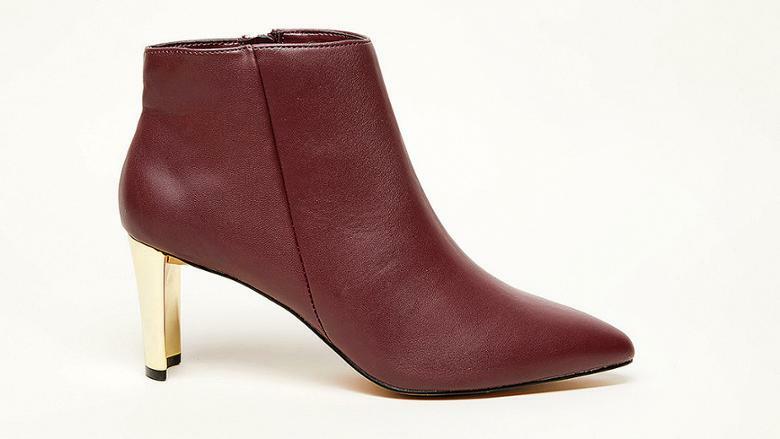 ‘It’s the perfect boot to add opulence to a Fall midi dress,’ says the spokesperson for Shoemart’s design team. While boots are available in brown, taupe, grey and black, among others, neutral tones make them versatile and easier to style with different outfits. But it’s the length of the shoe that categorises boots into several sub-styles. This is the risk-free boot and relatively easy to style. 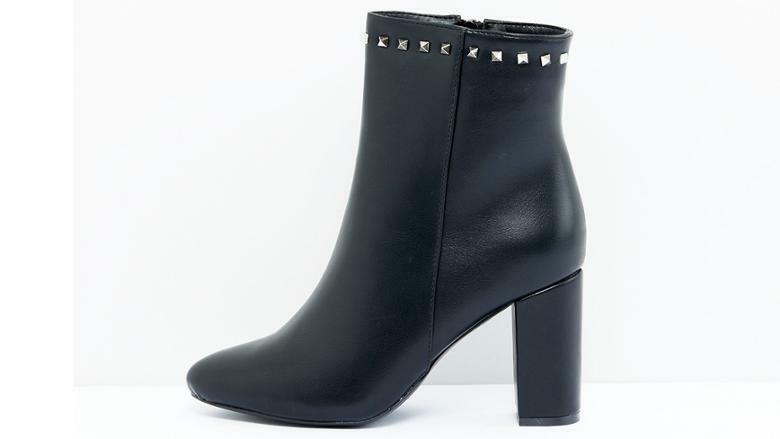 Booties come in various heel types ranging from block heels, wedges, stilettos, sock boots, Chelsea boots, biker boots and cowboy boots. 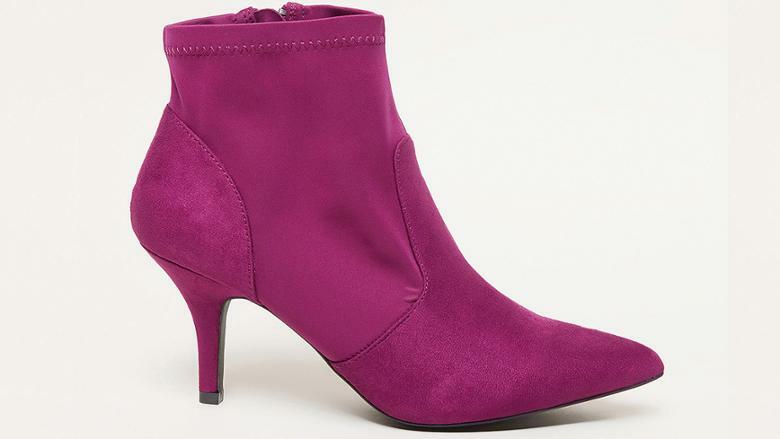 You can’t go wrong with wearing a skirt or a casual dress with these booties. When styling jeans, cuff the jeans above the boot rim and allow a bit of skin to show through as that helps to create an impression of long legs. ‘Wear short length boots paired with a midi length skirt for a casual look or pair them with slim leg jeans to focus attention on standout footwear pieces,’ says Ankur Srivastava of Max Fashion. In fact, skinny jeans is the one no-fail outfit that’s safe to pair with any kind of boot except maybe red thigh-high boots. Knee-high boots offer the middle path for fashionistas who don’t want to go too bold and sport over-the-knee boots. The higher the boots go, the dressier they become and the trickier they are to carry off. That’s why structured hard leather boots look much heavier and dressier than leather ankle-length booties. For those of you who prefer leather knee-length boots, go for the slouchy version. 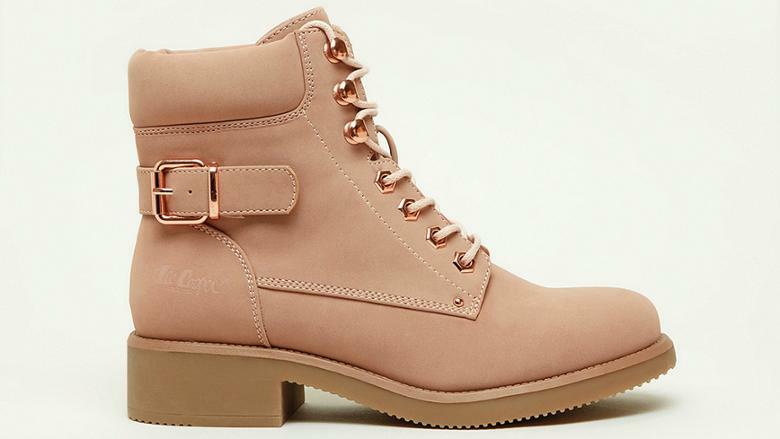 Slouchy boots are trending. They look much more effortless and less formal. These come in two glam lengths – over-the-knee versions and thigh-high styles. Of course, the height the boot reaches depends on the wearer’s height. Picking the right outfit length with these high boots can be a fashion dilemma for many. Here’s a rule of thumb: When styling thigh-high boots, always leave a distinctly visible gap between the dress hem and the boot. This makes the legs appear longer. The higher the boots, the more difficult they are to put on comfortably. 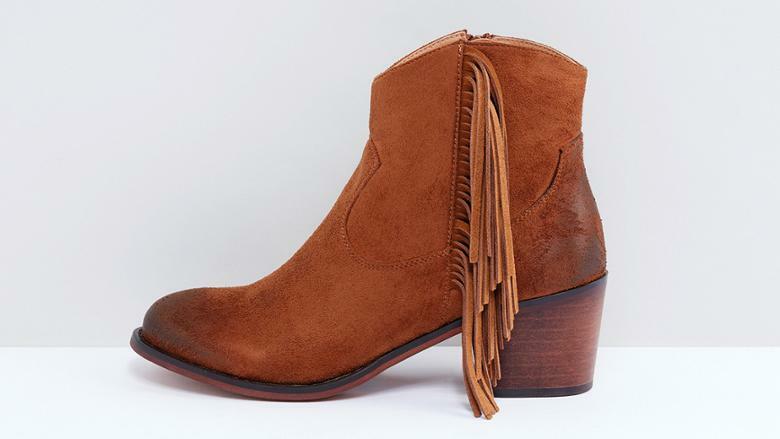 Being a softer, more flexible material, suede is the most comfortable option when it comes to taller boots. No, we’re not suggesting you head out and acquire the super-shiny red patent leather thigh-highs you saw on the fashion week runway. 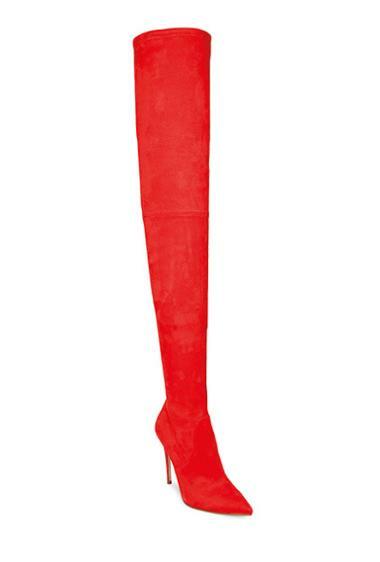 There are milder, more practical variants of the red thigh-high that work well for regular wear. 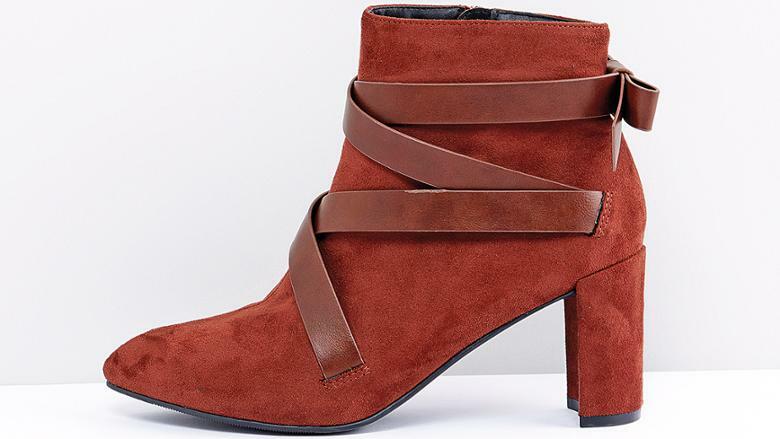 The secret to recreating the runway trend: Pick a red suede pared-down thigh-high stiletto boot and style it with a short dress for an evening out. Remember the rule for thigh-highs: Leave a couple of inches of skin visible between the outfit hem and the boot. A word of caution: Red thigh high boots are extremely tricky to style with jeans, so it’s best to stick to dresses or skirts when wearing them. Suede: Fill up the boot with crumpled newspaper balls to give it a fuller shape and then brush its surface carefully with an especially-made suede brush. Most problems disappear with just a bit of light brushing. Leather: Fill up the shoes with crumpled newspaper balls to give them a shape and then polish your leather shoes. Lastly, leave any tricky problems to the experts. Don’t risk ruining your boots. In fact, if ever there was a shoe to outsource to the experts’ care, it has to be the boots. Block Heels: A very comfy option, they add a smart professional look to an outfit. Stiletto Heels: With pointy heels, keep in mind that the higher the heel, the dressier the boots look. Flat boots: These are the most comfortable option for everyone, especially boots beginners. Flat boots aren’t recommended for petite women.